During Libya's ground assault on Tripoli the capital, which is a coastal city, a complete blackout was enforced on all Libyan TV channels and websites, of course to cover the truth, many journalists were held hostages at the Rixos hotel, NATO media claimed they were kept there by pro-Gaddafi forces, but we know that is not the case because selective NATO media were allowed out while other reporters were held hostages..
At that time large numbers of NATO & stooges, namely Qatar special forces set foot on Tripoli's land and went on a complete destruction and terror spree, we all remember how when they claimed they arrested Saif ul Islam Gaddafi and even Amnesty International and International Criminal Court has confirmed all NATO media reports his arrest, the man appeared in Bab Aziziyah at night in his own Land Cruiser with his men..
A similar tactic is being put for Syria, they started taking out Syrian TV channels, Addounia for instance is banned already by an EU resolution while all Syria TV channels were asked by the Arab League to be banned from Arab League Media body controlling Nilesat and Arabsat satellites, they attempted a couple of days ago to take Addounia TV channel off air and the station moved to an Iranian satellite on the same orbit of Arabsat with a slight frequency difference. 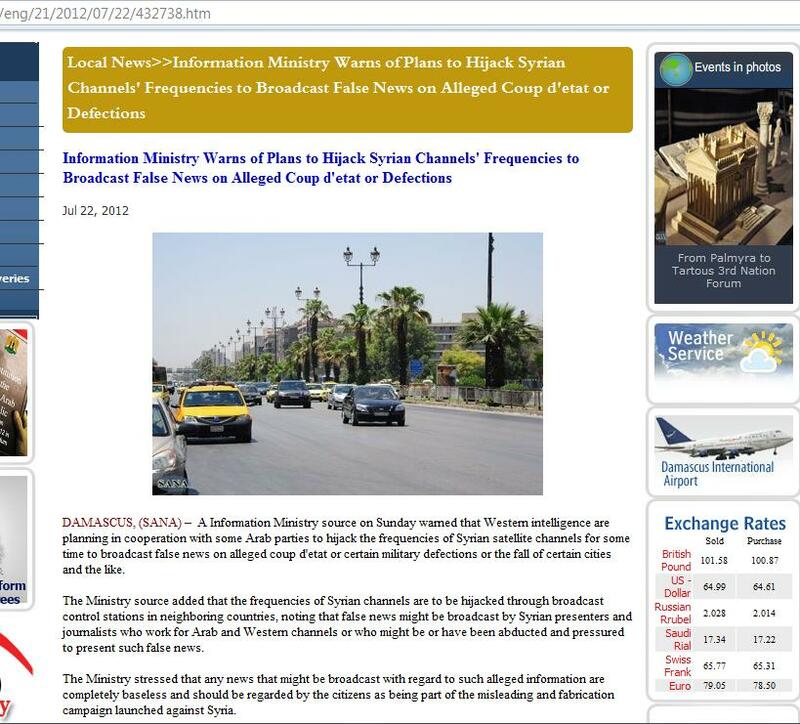 To be more aggressive and evil, twin channels were set up to each Syrian channel bearing same logos to broadcast staged, Hollywood styled fake news of the fall of Damascus, also as I showed in a previous post here yesterday a sample video of that. 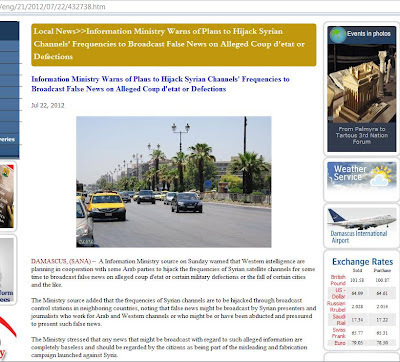 As for the websites, no thanks to Anonymous which proved to be one of the many NATO covert arms in NATO's propaganda and assault, they've taken on their shoulders the mission of targeting all Syrian state and pro state websites, the previous post here was to give you an alternative to SANA (Syrian News Agency) but still we're not sure if it'll hold up. They tried to influx a huge number of terrorists into Damascus but didn't expect Damascus citizens to help their army cleanse the city from them, however, due to the proximity of Damascus to both Jordanian and Lebanese borders with the existing of hostile groups spotted by many media outlets in both these countries, we expect another influx of such terrorists to hit the city at what they keep calling the Zero Hour. By the way, many of their Zero Hours have failed already and last one was the day they assassinated the top officials in Damascus on 18.July.2012, which western diplomats prior to the incident said literally at the UNSC deliberates: "an 'event' will occur today in Damascus that would change the entire course of the crisis" then the terrorist bombing occurred, which set the Russians more furious and stopped the negotiations. Don't believe what you see on the same channels that have lied before so many times at you, we're depending on God, our people and our army to defend our country at this very critical moments. Pray with us. If Syria wins, and she will win, the imperialists would be pushed back at least a decade and all the fake radical Islamists puppet regimes installed in other countries: Afghanistan, Egypt, Tunisia, Libya, Yemen.. would reverse order and get their free will regained. 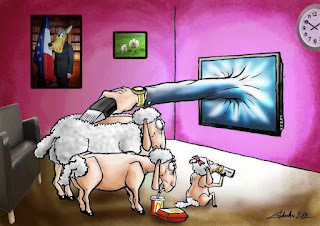 Our New World Order based on diversity and richness of world's cultures would flourish, their evil New World Order based on corporatism, slavery and greed would at least be delayed one generation until they grasp their breaths unless their hollow empires collapse from within.